That little old man on the John the Greek salad-dressing bottle, smiling jovially from the shelf at grocery shoppers, always seems to make the dressing aisle at H-E-B more cheerful. I discovered recently that this tasty vinaigrette — made with mystery herbs, olive oil, vinegar, and garlic — originated from an eponymous local restaurant. 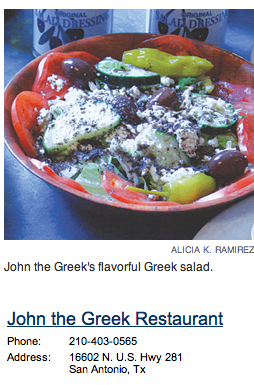 The day that Fast Foodie visited John the Greek, tucked in the back of the Thousand Oaks strip mall, a bird’s nest in the sign above the door and some trees off to one side of the entrance gave it a homey feel, fitting for a family-owned restaurant open since 1999. A friendly, alert server seated us almost immediately in the small dining room, which was busy but not crowded with lunch customers. After extensive deliberation between traditional Greek dishes such as moussaka (layers of ground beef and eggplant topped with a béchamel sauce) and avgolemono soup (chicken soup Greek style, with egg and lemon), my friend ordered a gyro and a side Greek salad for $7.50. I decided to branch out and try the Arni Me Agginares ($13.99), braised lamb with artichokes and the house egg and lemon sauce. My accompanying Greek salad came with the namesake dressing, which is tangy, refreshing, and pungent, a well-balanced complement to the tomato, olives, feta, and shredded iceberg and romaine lettuces. Sadly, I couldn’t say the same for my dish. The lamb, which was served in small chunks, had the consistency of cubed cheddar cheese. The artichoke hearts lacked flavor and were overwhelmed by the egg-lemon sauce. But perhaps I just had a bit of bad luck; the dishes being carried to other tables looked very appetizing, and my French fries were salivatingly crisp and minimally greasy. With many other classic Greek dishes to try and the platters of Greek pastries at the front counter calling to us, we resolved to return. We might even get to meet the happy man on the salad-dressing bottle.